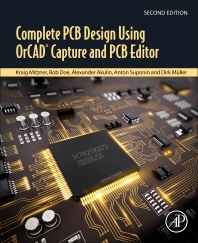 Complete PCB Design Using OrCAD Capture and PCB Editor, Second Edition, provides practical instruction on how to use the OrCAD design suite to design and manufacture printed circuit boards. Chapters cover how to Design a PCB using OrCAD Capture and OrCAD Layout, adding PSpice simulation capabilities to a design, how to develop custom schematic parts, how to create footprints and PSpice models, and how to perform documentation, simulation and board fabrication from the same schematic design. This book is suitable for both beginners and experienced designers, providing basic principles and the program's full capabilities for optimizing designs. Bob Doe joined OrCAD UK in April 1999 and moved to Cadence in January 2000 after Cadence acquired OrCAD. When Cadence appointed a UK Channel Partner in 2002, Bob moved to Parallel Systems Ltd. in September 2002 and has worked there since looking after post sales technical support and training courses. Parallel Systems provides front line support, sales and training for the OrCAD and Allegro Products. www.orcad.co.uk Parallel Systems has produced over 400 free tutorial videos for the Cadence software. Alexander Akulin gained his engineering education in Moscow Aviation University in 1990. He worked for 9 years as an electronics engineer in a Nuclear Physics Institute of Moscow State University. In 1999 he has founded the EMS company in Moscow called PCB Technology, which became a big holding providing PCB design, manufacturing, and assembly services in Russia. Alexander as co-owner and CTO of this company participated in creation of the technical department of PCB supply chain, PCB design center and the assembly factory “from scratch”. In 2012 he founded, together with several partners, PCB SOFT which provided system integration and eCAD sales services. In 2015 PCB SOFT Ltd became Channel Partner of Cadence Design Systems, and started selling OrCAD, Allegro and Sigrity tools in Russia including providing support, education and workshop services.